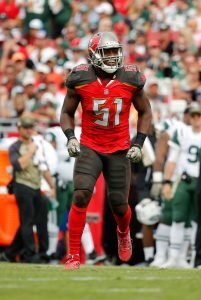 Buccaneers linebacker Kendell Beckwith, currently on the non-football injury list, returned to practice on Wednesday, according to Rick Stroud of the Tampa Bay Times. Beckwith was injured in an April car accident, suffering a fractured ankle that required surgery. He missed the entirety of Tampa Bay’s offseason program and the first eight weeks of the regular season, but he’s now healthy enough to begin practicing. The Buccaneers now have a three-week window during which they must decide whether to activate Beckwith or keep him on the NFI list for the remainder of the season. The Buccaneers can use all the linebacker help they can get, as they lost both Kwon Alexander and Jack Cichy to season-ending injuries in Week 7. On Sunday, Tampa Bay deployed Adarius Taylor as its primary ‘backer opposite Lavonte David, with Devante Bond, Cameron Lynch, and Riley Bullough in reserve. Last year, the Bucs used Beckwith at all three linebacker spots as he appeared in all 16 games with eleven starts. The 23-year-old had 73 total tackles on the year, including a 14-tackle game against the Patriots in the first month of the season. Beckwith wasn’t originally ticketed for a starting role, but he wound up playing on 847 snaps as a rookie after being selected in the third round of the draft. The kid appears to be a hard worker willing to do anything to help the team so it should be an easy decision.